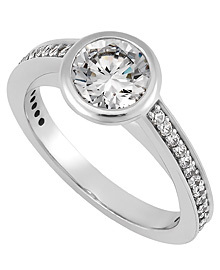 This 14k white gold 2.4 mm diamond engagement ring has 30 - .01 carat round stones. All diamonds have a color of G-H and clarity of SI. The center setting can be set with a round diamond ranging from .46 carats to 1.10 carats. Exquisite diamonds, as well as a matching band, can be found in Danforth's inventory.